We couldn’t wait any longer for another developer update for the Reborn project. Last week, we added support for WhatsApp and Messenger. Today we are adding another communicator to the sidebar – Telegram. 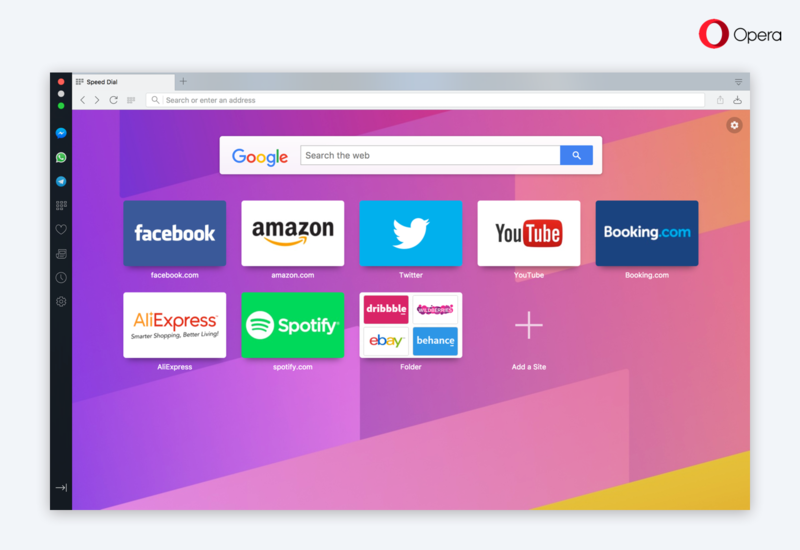 In addition to this, the latest update to the Opera Developer 45 brings some visible UI changes, faster video on Windows, and further tuning and fixes. 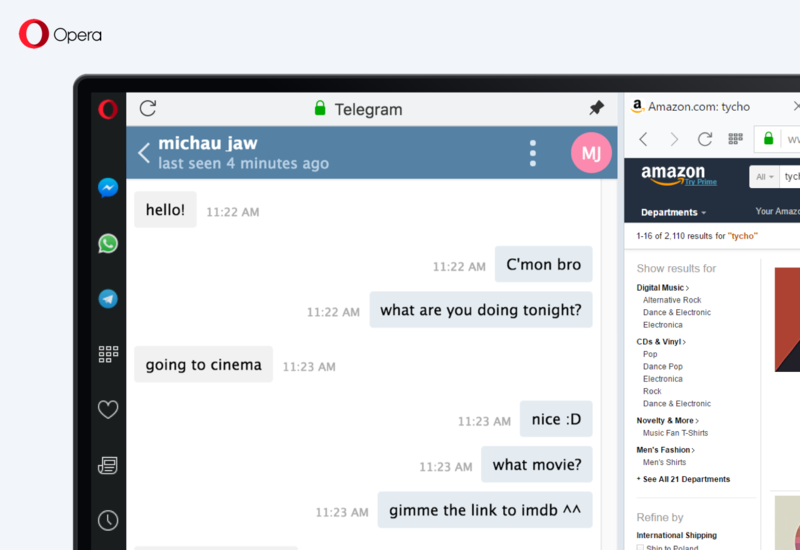 Telegram is a popular messaging app with focus on security and privacy. It allows you to send messages, photos, videos, and files of any type for up to 5,000 recipients. Now, you will find it in the new Reborn sidebar along with the already available Facebook Messenger and WhatsApp. Similarly to our current communicators, you can simply log in to the service and start chatting. Now with Telegram, the Reborn project has three communicators available by default in the sidebar. Do you think it’s too many? What do you think about having the most popular communicator visible by default, and others available as an option? Tell us your thoughts in the comment section. The new sidebar in the Mac version of Opera Developer can be now as narrow as on Windows. To adjust it, go to Settings -> Browser -> Sidebar -> “Enable Narrow Sidebar”, or use the sidebar context menu. Based on your requests, we have also brought for you a more familiar platform feeling on Window 7. 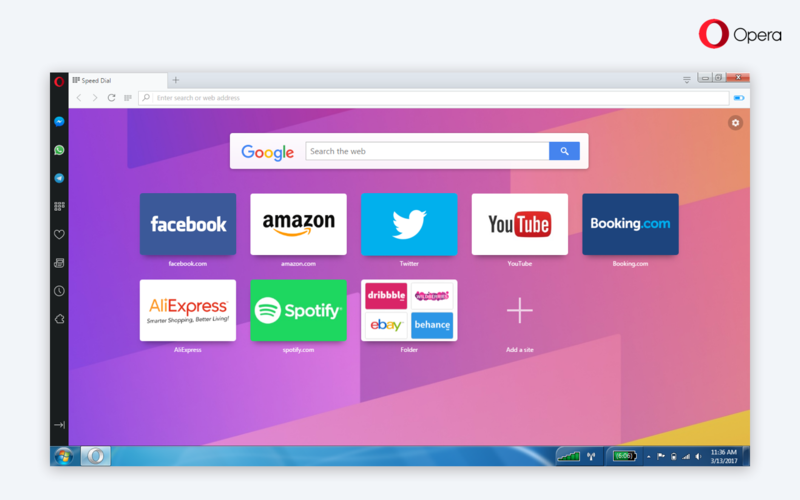 The latest version of Opera Developer for Windows 7 uses its system button to close, maximize, and minimize a window, as well as adjust transparent borders to fit to the platform. Most graphics processing units (GPUs) can decode videos highly efficiently. With this release, we will send even more videos to the GPU for decoding on Windows. This will allow for significantly higher framerates, higher resolutions, and lower battery usage for these videos. Since we (sadly) do not have access to all possible graphics cards and drivers, we are keen to hear about your experiences here. So try watching HTML5 videos and listen to an audio file, and if something is broken, please let us know in a comment or bug report. You can disable and enable the new code through the #media-windows-mf-demuxer flag in opera:flags. Big Buck Bunny (from HTTP links) is always a good test. A web page can play native videos through two different APIs: a streaming API (MSE) and by using video and source tags directly. This release makes the video and source tag API hardware-accelerated when using an H.264 (mp4) video on Windows, just as the streaming API has done for a long time. If this works well, we want to do the same for Mac and Linux.